For some reason I don't understand this family of fish called Antennariidae is referred to in the common tongue as frog fish. Frogfish are related to Melanocetidae, the finding nemo style angler fish. Frofish also have lures to catch their prey. Some frogfish can swallow prey twice their size. Their body is covered with weird bumps and spines and some species will grow plants or animals on their skin to camouflage. Many frog fish posses the ability to change their color or even their shape to aid in camouflage. They don't swim very much, which is weird considering they are fish. They prefer tho use their fins to walk along the ocean floor. The next image is my own, do what you want with it. 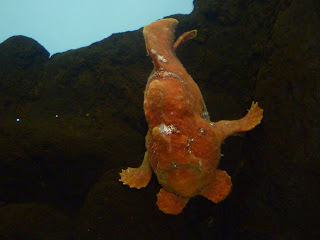 Frogfish live in tropical and subtropical water all over the world. Unlike many related families they are usually shallow water dwellers often living in reefs. There are a few deep sea species.